GreenvilleEq: Tiny House Seminar...The world of good design. A friend of mine introduced me to Bulls Eye with Jesse Thorn and I spent hours and hours listening to the podcasts....Jesse Thorn in turn introduced me to 99% Invisible and I spent hours and hours listening to Roman Mars talk with people who are doing amazing things in the world of design and architecture. "Always read the plaque" has become my new motto and I think I may have missed my calling and should have been an architect. The best designs are the ones that you do not even know are there. So we are building a tiny house in Greenville. I suppose that I am split. Part of me wants to hate that moniker of "tiny" house because it implies that it is small and cramped. That is not the case if it is done right. I have a 1000 sq. ft. home and I rarely leave my bedroom. I walk in and wheel my bike through the empty living room, down the hall and into my bedroom. So often do I think that the stove should be closer and that it is a hassle to heat the whole house when I only need one room. I only shower and have not taken a bath probably since I was a toddler. I and like minded individuals can get along pretty well in about 450 sq. ft., if that. Is this going to be easier or harder? We have the land and the next big step is to start talking to the city about plans and permits. The design we are wishing to implement would likely fit in my neighbors' garage. They own a sprawling (I am not sure what makes a mansion a mansion, but I will say that they own a...) mansion. It takes up near the entirety of their property and has a small yard and a green belt approximately 2 feet wide that circles the house. I do not judge...More power to them. 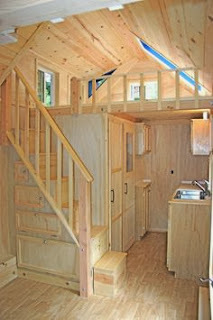 We are going to go look at this idea of the tiny house from all angles and all phases. Our tiny house is going to be a work of useful art. It is going to be small. It is going to be cheap(er). It is going to be sustainable. It is going to be semi mobile (yes, at some point we are going to move it) and that, in and of itself, is going to be amazing. We are going to show people that owning your own home is not impossible. We are going to show people that living comfortably in this world is not out of reach. We are going to show people a design not just for this house, but for life. If you want to be a part of this seminar on urban development and construction while learning to build your own tiny house, please sign up. It is a four week course on home ownership and construction. These projects help to make all of our endeavors affordable and your involvement gives you a hands on look at what goes into these homes. Week 3 Electrical and more. Week 4 Decoration and moving in.